This is the latest illustration for an agricultural magazine. 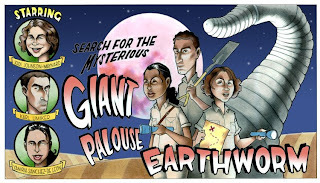 The story deals with, appropriately enough, the Giant Palouse Earthworm, which can grow up to three feet in length, spits, and smells like lillies. This piece the latest in a recent personal trend of 1950s-style homages.